So far admin1@allstatesnotary.com has created 39 blog entries. We have just added an appointment booking system for our Notary and Live Scan services. You can now conveniently book your appointments online. Appointments are at our office in Glendale. For mobile service please call us at 818-245-1345. All States Notary is proud of its client relationships, and happy to share the observations of those who best know what it’s like to work with us. Check out our Client Testimonials. Notaries are often challenged to accept foreign ID’s for notarizations. After all 43 million people from other countries are living in the United States. Foreign passports are the most commonly acceptable form of foreign identification for notarization, but state laws vary on the requirements. For more information please check out NNA’s article Are International IDs Acceptable for Notarizations? Take your State of California required Notary Public Courses Online! Become a California notary for the first time or renew your California notary commission. The National Notary Association’s 2015 conference will be held in Orlando, FL from May 31 – June 3, 2015. Every year, the this annual conference brings together hundreds of notary professionals from around the country for an unparalleled networking and educational experience. Hear from dynamic and engaging presenters from all facets of the industry, get up to speed on the changes directly impacting your business, network with industry peers and learn about the latest products and services available to keep you on target for success. Registration is now open. For more information go to the National Notary Association Conference Webpage. 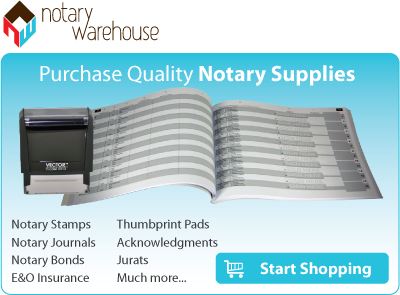 Get quality notary supplies like premium notary stamps, notary journals and other notary supplies at discount prices at Notary Warehouse. Leading lenders and title companies have created the first set of recommended best-practice standards for Notaries handling loan signings. These standards are called the Certified Signing Specialist Standards and form the basis of a new designation for signing professionals: the Certified Signing Specialist. That is a Notary who has met all of the elements of the standards. The publication of the Standards is among the most significant developments to hit the loan-signing profession in years, and it will help Notaries meet the needs of nearly every firm in the real estate finance industry. In turn, Notaries will be eligible for more jobs that will help them thrive in the current market. Notaries are often asked by signers to verify that a reproduction or photocopy of an original document is a true, complete and correct copy of the original. This is called “certifying a copy” or “copy certification”. Whether you can do so isn’t always clear-cut. To learn some important facts, please read this article about copy certification from the National Notary Association.